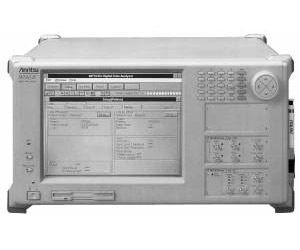 The MP1632C digital data analyzer, a 3.2 Gb/s BERT that not only conducts bit error rate testing but can also measure burst signals and evaluate waveform quality. Featuring a wide frequency range of 10 MHz to 3.2 GHz, the MP1632C is an excellent tool in R&D and manufacturing of SONET/SDH systems, WDM components, G/bit Ethernet and Fiber Channel systems, as well as digital ICs. Combining a pulse pattern generator and error detector in one instrument, the MP1632C has strong analysis capability, including built in eye margin and eye diagram measurement functions. For further accuracy, the eye opening (margin) is shown as a function of bit error rate that is not supported by a digital oscilloscope. The built in pulse pattern generator outputs high quality data and clock waveforms. Typical rise/fall time for data and clock is Features 3.2 Gb/s PPG and ED in one cabinet Eye diagram measurement and burst signal measurement supported 8Mb Programmable Pattern ED has 25mVp-p of sensitivity Supports burst signal measurements High quality data and clock waveforms Compact size, portable and lightweight.